Antibiotics only work for bacterial infections … not viral infections. They are ineffective at killing viruses. Viral infections include colds, flu, runny noses, most coughs and bronchitis, and sore throats unless they are caused by strep. Sexually transmitted viruses include human papillomavirus (HPV), herpes simplex virus, and HIV. So what’s the big deal if you treat a viral infection with an antibiotic? This last point is most important. There are not a lot of new antibiotics currently being developed, and it takes a long time to develop effective ones against these new resistant strains of bacteria. Infections such as MRSA (methicillin-resistant Staphylococcus aureus) are now very dangerous and more difficult to treat because none of the old antibiotics work anymore. In the example of gonorrhea, which is widespread and used to be easily cured, the Centers for Disease Control and Prevention no longer recommends oral drugs in the United States. Injectable ceftriaxone is the only remaining effective drug that can treat gonorrhea, because the bacteria that cause gonorrhea have developed resistance to every other drug. What types of infections might be bacterial? Urinary tract infections (including bladder and kidney infections), wound and skin infections, strep throat, severe sinus infections, and certain ear infections are some examples. There are also sexually transmitted diseases (STDs) caused by bacteria, such as chlamydia, gonorrhea, and syphilis. Talk with your health professional — do you really need an antibiotic? What else can you use or do to feel better? Sometimes you may not get better with one course of antibiotic, and since different antibiotics target different groups of infections, you may need an additional course of another antibiotic. Some people have allergies to antibiotics or may be on other medications that interact with antibiotics, so be sure to discuss all your meds and allergies with your health care provider. Misuse of antibiotics has become a global health problem and is causing great concern among the health community as many microorganisms develop resistance to our arsenal of antibiotics. Responsible use of antibiotics is the key to protecting our future health. Planned Parenthood treats bacterial infections such as urinary tract infections and bacterial STDs. Schedule an appointment at any Planned Parenthood health center to be treated for these infections — we can prescribe antibiotics and help you get the most out of them! 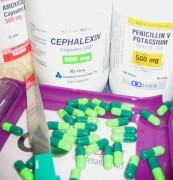 This entry was posted in General Health and tagged Alexander Fleming, allergies, aminoglycosides, antibiotic resistance, antibiotic resistant gonorrhea, antibiotics, antimicrobial, bacteria, can I take antibiotics for herpes?, ceftriaxone, cephalosporin, chlamydia, do antibiotics cure STDs?, drugs, evolution, fluoroquinolone, genital warts, Get Smart About Antibiotics Week, gonorrhea, herpes, HIV, human immunodeficiency virus, infection, infectious disease, macrolides, medication, methicillin-resistant Staphylococcus aureus, microbe, microbes, microorganism, microorganisms, misuse, MRSA, natural selection, penicillin, proper antibiotic use, sexually transmitted disease, sexually transmitted infection, side effects, STD, STDs, STI, STIs, syphilis, UTI, UTIs, virus, viruses by Rebecca. Bookmark the permalink.